City of Gold. That the name for Ballarat, a city located in the west of Melbourne, the capital of the State of Victoria, Australia. The content of gold in Ballarat making the city one of the largest gold supplier in Australia despite the country's economy relies more on the services sector. Before gold was discovered in 1851, Ballarat is a residential area 25 Aborigines, the original inhabitants of Australia. For Aboriginal people, Ballarat is considered as a place to rest. Ballarat invaded by settlers after gold was discovered. They come from various countries and settled in Ballarat. Within a year, Ballarat transformed into a bustling city. Distance Melbourne to Ballarat is only about 112 kilometers. In addition with car or bus, traveling to Ballarat also be taken about an hour by train from Melbourne's Southern Cross Station. Throughout the city, old buildings standing Victorian-style architecture beautifully. Lake Wendouree which used to be an Aboriginal camping places are still intact and well preserved. Done around the city, proceed to Sovereign Hill open air museum. Once entering the area of ​​the museum, it feels like going back in time 158 years ago. A replica of the city with the atmosphere like in the cowboy movies. There are looks row buildings that all made of wood. Posts large capital lettered marker in front of the building into the building business functions. In front of the building are lined, the dirt road divides the city. 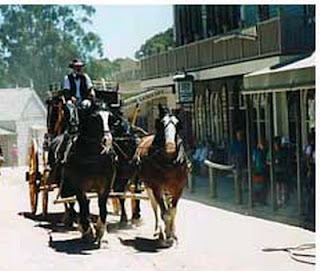 Several horse-drawn carriage passing along the road carrying passengers which is none other museum visitors. In a small cottage on the corner. Town atmosphere more alive with passing "people" who are busy doing activities. Replication past Ballarat city is divided into three regions, namely for business, residential, and mining. In the business district, lined with buildings that once served sectors of goods and services, such as bakery, confection, banks, gold shops, post office, hotel, restaurant, and a tin shop. The building was not empty. In addition to showing the functions of the building earlier, most of the buildings were really functioning as intended. The next exploration is the Red Hill Gully Creek and Red Hill Minning. Two place, describe as the atmosphere searching for gold in Ballarat. In Red Gully Creek visitors seemed enthusiastic panning for gold. The museum claims to the river there contains real gold. At first, gold in Ballarat obtained by panning for alluvial deposits in the river. After gold in the ground exhausted, prospectors dig the tunnel to take gold in the bowels of the earth. Journey through the museum was continued into the bowels of the earth. Accompanied by a beautiful guide, visitors can walk along the tunnel 200 meters deep in the bowels of the earth. According to the guide, the tunnel is a path made ​​up of miners in search of gold. There was only candlelight that illuminates the tunnel that branching.